There are lists all over the blogosphere of things people want to do before turning 30 years old – it seems to be the magic (or rather opposite of magic) number that makes people panic and suddenly realise they’re getting old. 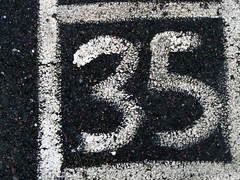 With time running out before my 30th, I decided to leap straight onto the 35 before 35 bandwagon. Anything to help me feel like I’ve achieved something in my life! You may notice that some of the items on my list were taken from my 101 things to do in 1001 days, which I failed to finish. Hopefully I’ll have better luck with this challenge. Marille is Austrian German for apricot and a Knödel is a kind of dumpling – so it’s an apricot filled dumpling. It’s an Austrian speciality but I never had one while I was livng there! What about knit a pair of socks? Travel on the Orient Express? Go on a cruise? Your list is full of adventures. I love it! What are the OU courses? I am intrigued by #21 and may start to read those myself. I have to confess, I haven’t started one yet! I had a whole list of ones I wanted to do, but I lost it so will have to look again. Ukraine is fanstastic, come on over!! : ) Which part of the country do you want to visit? My grandad was Ukranian and he came from a small village close to Lviv, so I would love to go there. This is an excellent idea! Great list. I hope to visit Germany and Austria next year. Such a long way for us Australian’s to go! This is a really great list but….garlic soup? !